Decline in memory and normal thought processes, as well as increased risk for digestive cancers are ever present on the minds of many aging adults. Degenerative brain health leading to Alzheimer's dementia and a lifetime of poor diet precipitate increased risk for colon cancer, both chronic conditions that are easily prevented by maintaining adequate magnesium stores at the cellular level through supplementation and healthy diet. Magnesium deficiency runs rampant with children and adults of all ages as the essential mineral is removed from many foods and grossly lacking in most natural vegetable sources due to depletion in farmland soils. Magnesium is required to maintain genetic integrity, reduce systemic inflammation and to complete a number of critical enzymatic reactions. Decades of suboptimal intake are a recipe for dementia and cancer. A research team has published the results of a study in the journal Neuron to explain how magnesium directly improves synaptic plasticity. Lead study author, Dr. Guosong Liu has found that various regions in the brain associated with learning and memory experienced significant improvements in synaptic function as a result of magnesium dietary supplementation. He noted "Our findings suggest that elevating brain magnesium content via increasing magnesium intake might be a useful new strategy to enhance cognitive abilities." 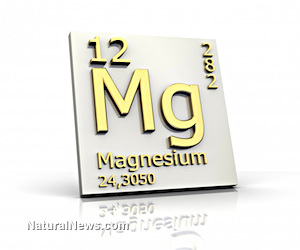 Additional evidence for the importance of dietary magnesium is published in the American Journal of Clinical Nutrition. Researchers reviewed dietary questionnaire data on 768 participants to determine food frequency consumption. The scientists also combined six prospective cohort studies to find a significant association between dietary magnesium intake and risk of colorectal adenomas. The study demonstrated that for each increase of 100 mg of magnesium per day, the risk of colon cancer drops by 13 percent. Researchers conducting this study concluded "Our findings support the hypothesis that higher intakes of dietary magnesium are associated with lower risk of colorectal tumors. The consumption of magnesium-rich foods may be a new avenue to explore further in the search for cancer-prevention strategies." Interestingly, the study found that while supplementation with magnesium effectively lowers colon cancer risk for everyone, optimal risk reduction was noted for those participants who were either overweight or obese. Magnesium lowers cellular inflammation that causes a slow degenerative process in overweight individuals. The mineral also helps prevent premature degradation of DNA that can lead to genetic mutations and tumor development. Nutrition experts recommend supplementing with 600 to 1,000 mg of a quality form of magnesium daily to prevent Alzheimer's dementia and halt colon cancer progression in its tracks.